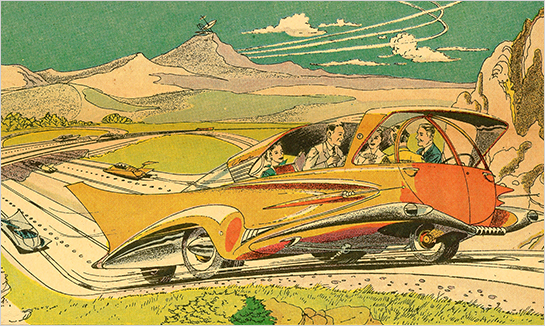 Radebaugh’s creative visions were fueled by a post-war optimism that centered around new technology and progress, ideas that were still en vogue when his work began. There’s very little trace of cynicism in the concepts he put to paper, even though they dealt with topics like disease, famine, and military conquest. 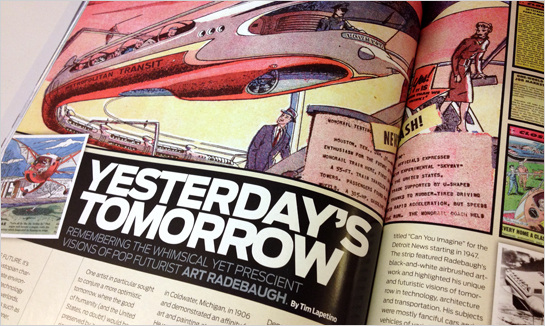 While some might look back on that perspective as naive, the reality is that Radebaugh’s art is a product of his time. Each piece is a unique reflection of a more hopeful time. This issue of Geek is available in digital editions, or at local book retailers. But our work with Art Radebaugh and his artwork has barely begun. Watch this space for some upcoming Radebaugh-focused announcements. We’re excited about what the future (of the past) holds. Closer Than We Think & Can You Imagine? © Tribune Content Agency, LLC All rights reserved. Used with permission.